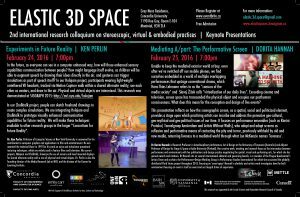 During a four-day international research colloquium from February 24th to 27th, 2016, the Elastic 3D Space group of Artists and Researchers, Designers and Computer Scientists, will explore stereoscopic technologies within artistic practices. 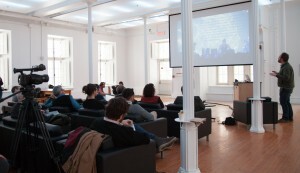 This event brings together over 15 researchers, artists and industry experts to share their research explorations on elastic space, augmented and virtual reality,and future reality within multiple disciplines from six university Art Departments, two cultural production and exhibition sites, along with departments of Computer Science and Software Engineering, Art History, Performance Studies, and Design across three continents. 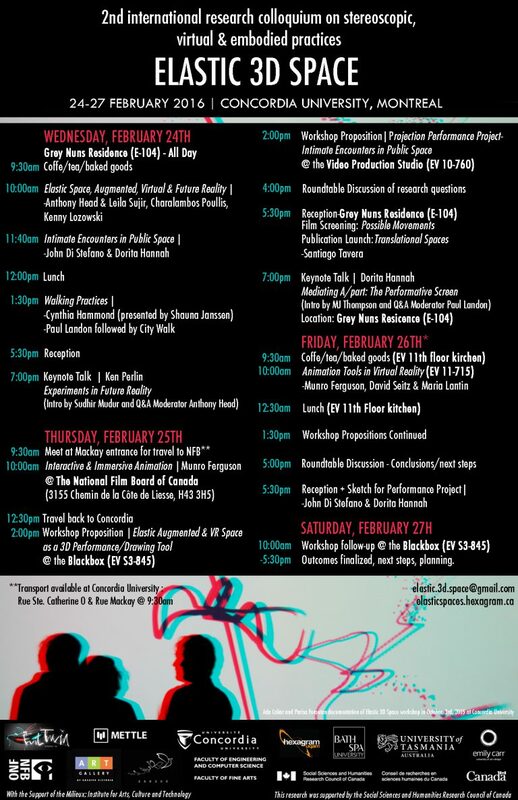 The February 24-27 event will start with a day of presentations including a walking tour in the afternoon, followed by three days of workshop research exchange, with hand-on workshops, a session at the National Film Board stereoscopic studios, roundtable discussions, 3D drawings demos and virtual drawing prototypes. 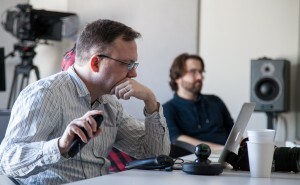 This exchange will focus on both the technical exploration of stereoscopic technologies and software, while questioning its perceptual effects. It will deeply investigate the way our bodies relate to our built environment and interact within the illusory elastic 3D space. This event intends to explore specific questions relating to the topic, helping further define and explore elastic space. 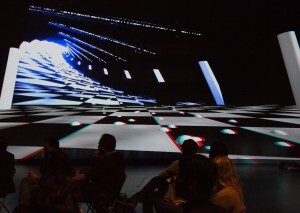 The discussion will range across augmented, virtual and future reality spaces, with variations from high tech to low tech, including a stereoscopic mapped projection as a low tech VR CAVE space. 1) In the future, when techniques such as 3D stereoscopy mean that everyone can see in a computer-enhanced way, how might our new sensory capabilities affect people’s engagement with the places and people around them, our senses of belonging, connection and agency, our creative expression through art-making? 2) What technologies and artistic approaches are needed to explore stereoscopy and what opportunities do they provide for artist practice? 3) What lessons for artistic practice can we learn from recent and past histories of stereoscopy? 4) How can audiences engage with stereoscopy while walking in the city, participating in an artwork? Chris Bobotis and Nancy Eperjesy- Mettle: software developers 360/VR production tools for After Effects: SkyBox Studio. This website presents Elastic 3D Space, the international research exploring art practices in relation to human movement, from body movements to human migration. Elastic Space is exploring this theme through technological media such as stereoscopy including 3D video, VR and AR and related technologies, as well older media approaches. 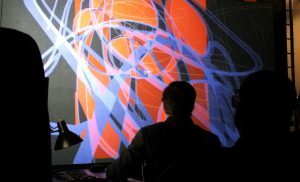 It takes the projected or tv screen as a given and looks at the space behind and in front of it, in order to research artistic and social possibilities when technical considerations are no longer a barrier.